Looking to peace out from work and escape the terrible heat outdoors for two hours straight? 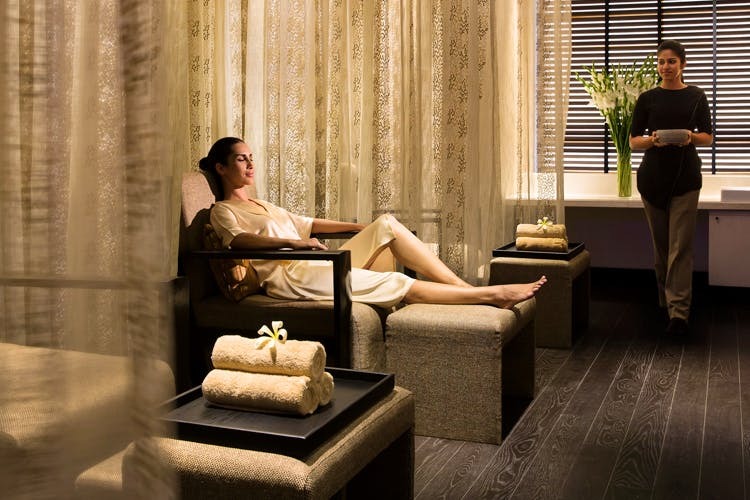 Invest in the signature treatment at the Spa By JW, JW Marriott Hotel, this summer. Seriously, it is so hot right now in Bangalore (even with the 4 ‘o’ clock showers) that if you can’t escape to the nearest hills, you are going to stew. But thankfully there is such a thing called a spa session and nothing makes more sense than splurging on one when you need it. We were invited to check out JW Marriott’s summer spa menu at the Spa By JW, and we happily left behind our worries to check into the cool confines of the beautiful spa. After cooling down with a glass of lemon, mint ginger and honey concoction and filling out a form for possible ailments and any other health issues, we we’re led into a dimly lit room with ambient muzak, and we changed into a comfortable robe (one size fits all, thankfully) and slippers. The treatment (it is the spa’s Signature Spa experience) is actually for two hours straight, if you want to do justice to it. But we played foul and made them give us an express version for an hour. The experience does cost INR 7,000, so please make good use of it and get your treatment for two hours. The process involved a cream-based scrub (a lovely, cooling sandalwood and saffron one), followed by a thorough sandalwood oil massage with plenty of stretching involved. The masseuse, Jyothika, started off by doing a quick scrub and dipping my feet in hot water. Then I lay down and left behind my phone, worries and everything else. The soothing and cooling sandalwood (it’s the Karnataka connection) scrub was applied with gentle circular motions to increase the blood circulation. It was applied all over (remember this is a full body massage so you may have to leave your inhibitions outside the door). After a quick shower to rinse off the scrub and dead cells, we were back at the massage table for a sandalwood oil massage. I requested for gentle pressure, and the masseuse did justice unknotting all the tension and stress away from my body. The music and air conditioning were not intrusive and the hot oil helped balance the temperature and soon I felt like sleepy. After an hour of thorough massage, my treatment was complete and I finished off with a refreshing shower. Though the experience is pretty expensive, the two hours of spa therapy might make this one an occasional splurge. Spa by JW also offers several other shorter and express treatments including everything from mud wraps to sugar scrubs and Ayurvedic massages, which might not be so cheap. So do check out their summer spa menu.